A graduate of Rhode Island School of Design (RISD) and former New England Art Director of the Year, Bob Cipriani is a widely recognized graphic designer. 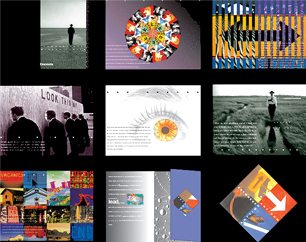 He has won over 800 regional, national, and international design awards, including those given by the American Institute of Graphic Arts, Art Directors Club, Type Directors Club, Hatch Awards, Andy Awards, Communication Arts, Print magazine, Graphis Annual, and many other leading design organizations and publications. Bob was a partner in Gunn Associates until 1980 when he founded Cipriani Design. In 1991, he became chairman of the design division of Arnold Worldwide in Boston. He has been responsible for the creation of integrated design systems for Sappi, Brown Brothers Harriman, Cole Haan, Bass, Zildjian Cymbals, Fidelity Investments, National Financial Services, Four Seasons Hotels, Atlantic Monthly, Thinking Machines, Bull, and others, as well as the creation of major projects for MFS Investment Management, Fleet Bank, John Hancock, State Street, Bitstream, Thermo Electron, and others. Bob has also created corporate identities for more than 100 companies and charitable organizations. His work has been featured in Communication Arts, Print, Graphis Annual, and Print Casebooks. He has been invited to judge a number of creative shows, including the New York Art Directors show and the American Institute of Arts California show.